My collection of black books. 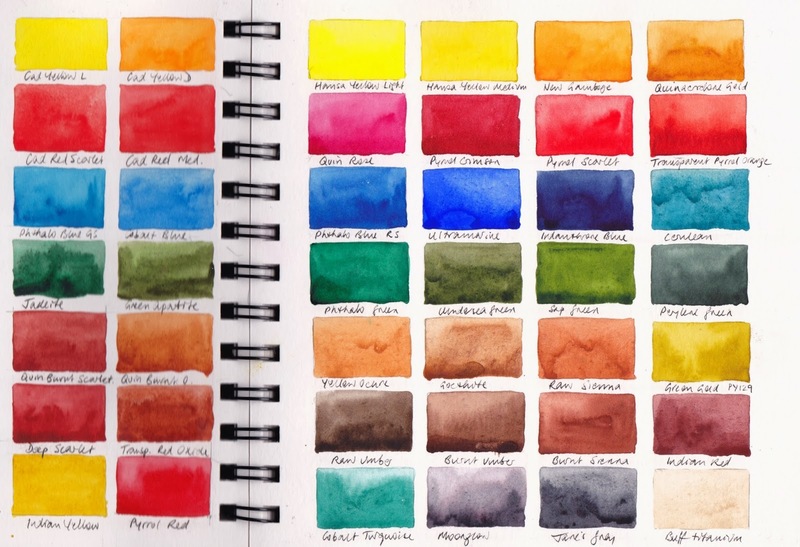 My previous post in this series was about Moleskine Watercolour Notebooks which you can find here. 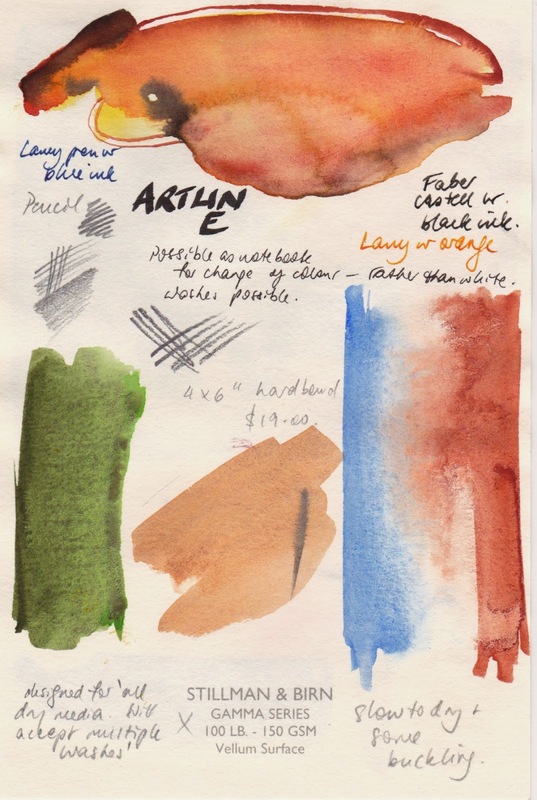 Here I'll look at the sketchbooks am papers I have tried more recently from Stillman and Birn. These come in a range of sizes, paper weights, paper colour and binding styles and are known as Alpha, Beta, Gamma, Delta, Epsilon and Zeta. You can see the whole range on their website here. It is a great range of books with something for everyone. 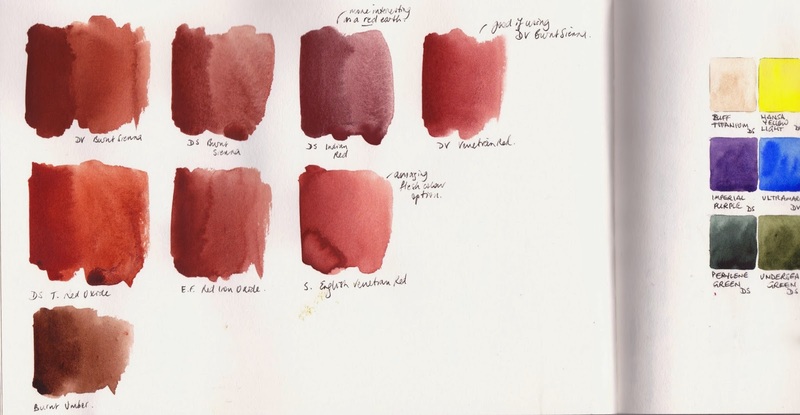 This chart from their website is very helpful as it shows the weight, colour, surface and intended use of each book in the range. It can be found here. Unlike many of the books available these days, Stillman & Birn books do not have an elastic strap to hold them closed, or a pocket in the back to hold extra pieces of paper. Or a pen holder. If you want these features you need to add them yourself. square spiral bound Beta books. The Book on the left is my Pocket Alpha 4" x 6". Alpha is white paper that is very versatile. It calls itself a 'dry media, light wash and ink' paper but takes even heavier washes surprisingly well, is nice to draw on and being 150gsm paper you get a lot of pages in each book. I use this hard bound portrait format pocket version as my sketch/notes/colour play book that I keep with me all the time. The second book in the photo is the larger landscape version that I enjoy to test out colours in my studio and for pen and wash or pencil and wash sketches and quick studies. It is slightly larger than the 'Large Moleskine'. I don't use it for more serious paintings, but one could. It's a fabulous paper and I really like it's versatility. Below are scans of two pages from this book. 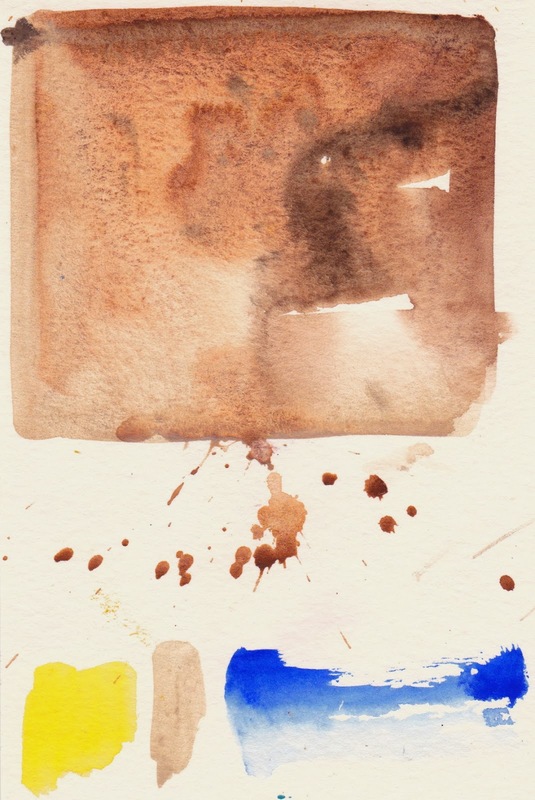 Watercolour sketch of a statue in an Alpha 9" x 6"
Samples of watercolour testing a range of Burnt Sienna and Indian Red varieties in my Alpha 9" x 6" landscape format sketchbook. 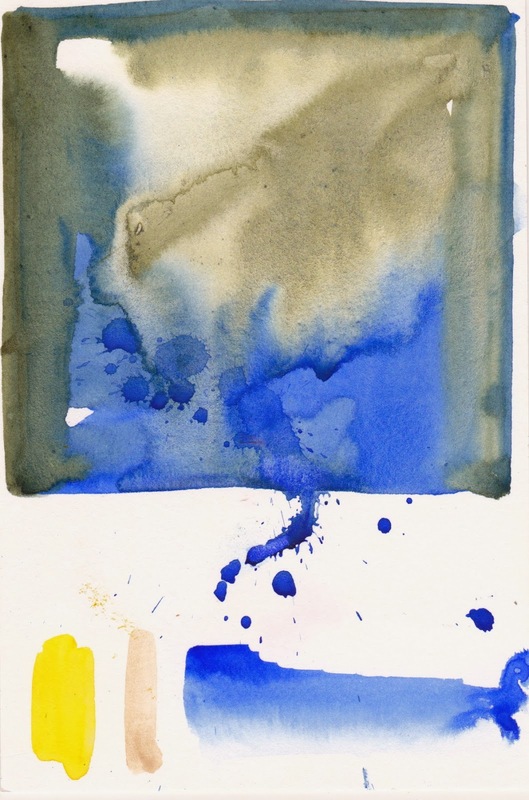 Notice that the watercolour washes are quite strong but there is not a lot of buckling. However, there is some degree of show-thorough so I certainly wouldn't paint serious sketches on both sides of the paper. Paint on one side, writing on the other is perfect. 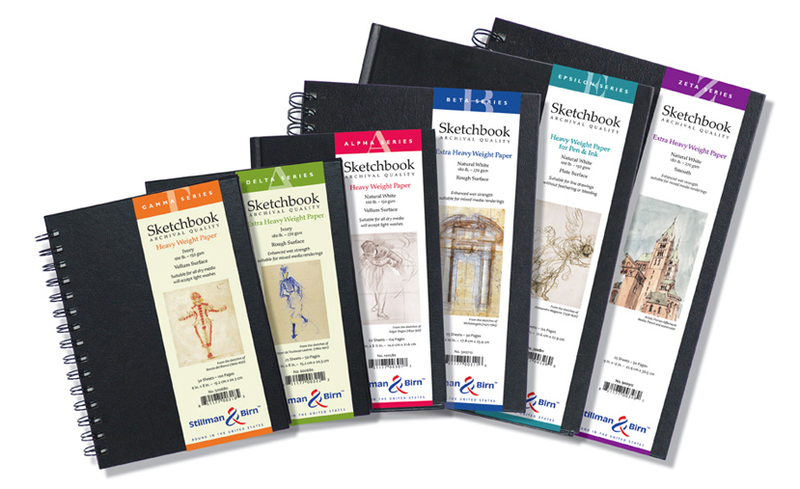 There are a range of sketch books available in the Alpha as shown here. The two books on the right in the photo at the beginning of this post are Beta square 7" spiral bound. Beta books are made with heavier 270gms paper so there are less pages in each book than the Alpha. Each page can certainly be painted on both sides. So far it is not available in my favourite hard bound landscape format, but it is in either hard bound or spiral bound versions in a range of sizes as you can see here. 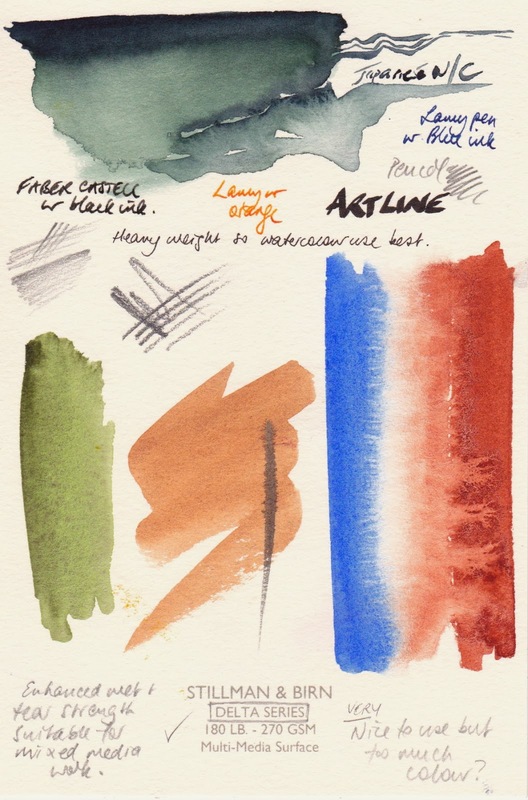 It is lovely paper to paint on and though not smooth it also works well for pencil and ink drawing or writing. 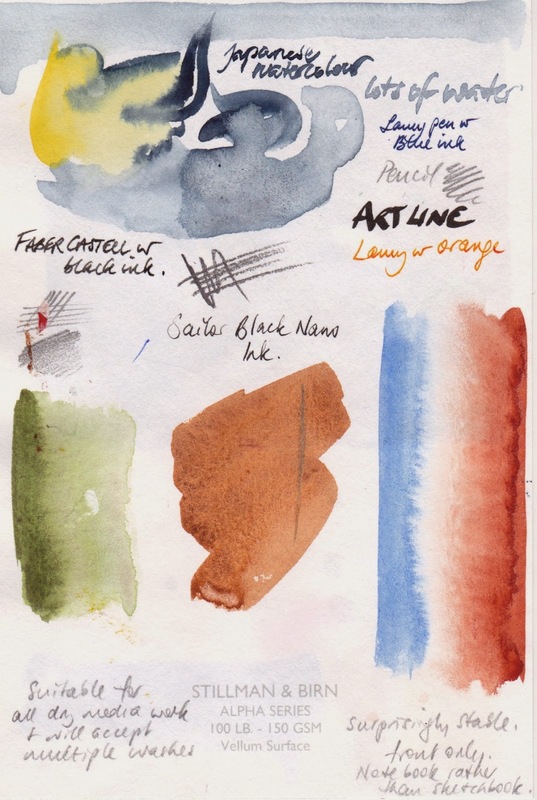 Painted swatches on both sides of the paper in a Stillman & Birn Beta 7" spiral bound sketchbook. The Gamma is the same 150 gsm paper as the Alpha but in ivory. I haven't used a book in this range yet as I prefer white paper so far. I do have a pocket version waiting though...I have tested the paper and it works beautifully for its designed use for 'dry media, light wash and ink' and is really lovely. I tested a yellow and Buff Titanium on each sheet to see how well they showed up and there isn't a problem. 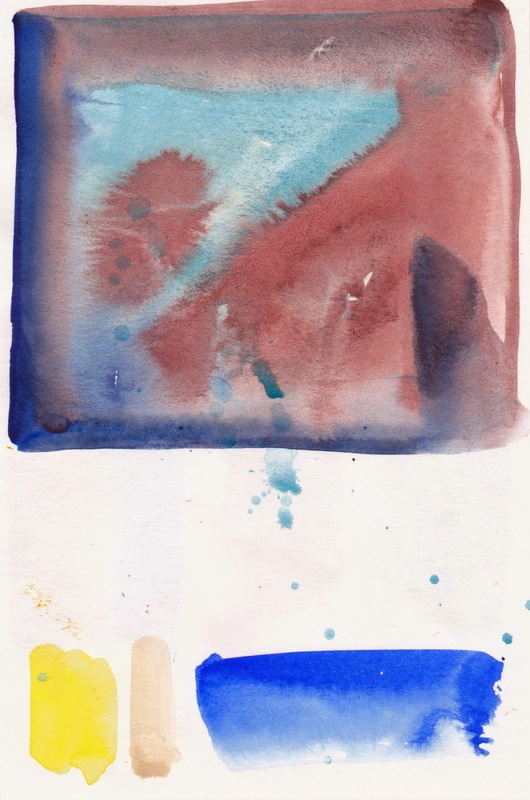 S&B Gamma paper test - back with wet wash. 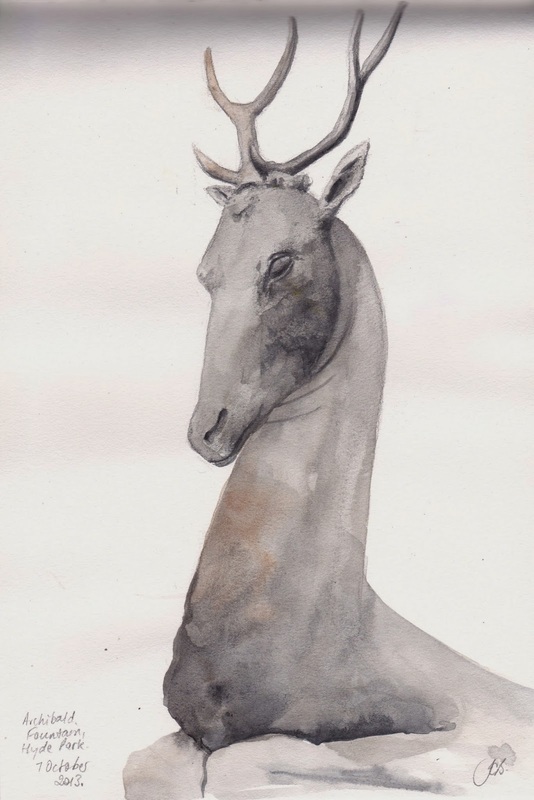 The Delta is 270gsm Ivory paper. The same characteristics as the Beta but in Ivory. Once again, I have tested the paper but not used it in a book. 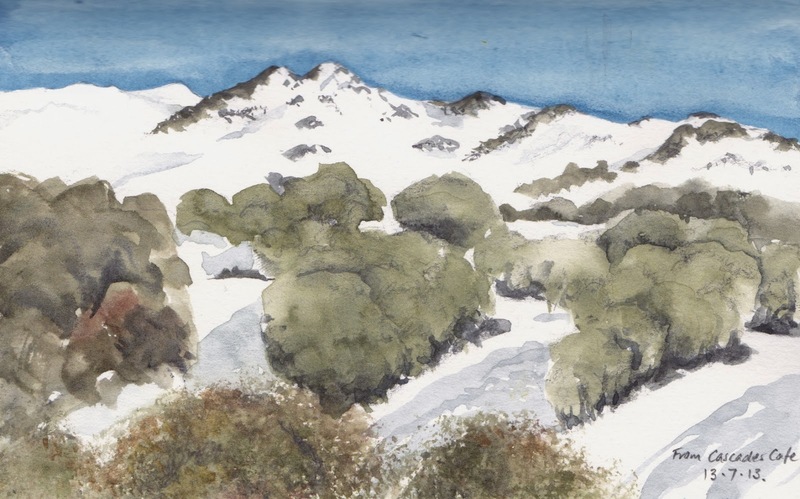 I really love the paper, but am not sure about the slight ivory tint for my own work - perhaps just for warm scenes without any white? It is a very soft Ivory by the way, not a strong tone. Epsilon is Smooth white 150 gsm and Zeta is smooth white 270 gsm. These are also lovely papers, but I seem to recall they took a long time to dry. I haven't used them in a book as yet...I'd suggest these would suit those who like to write a lot of text as well as and draw/paint, or simply those who want a smoother surface. 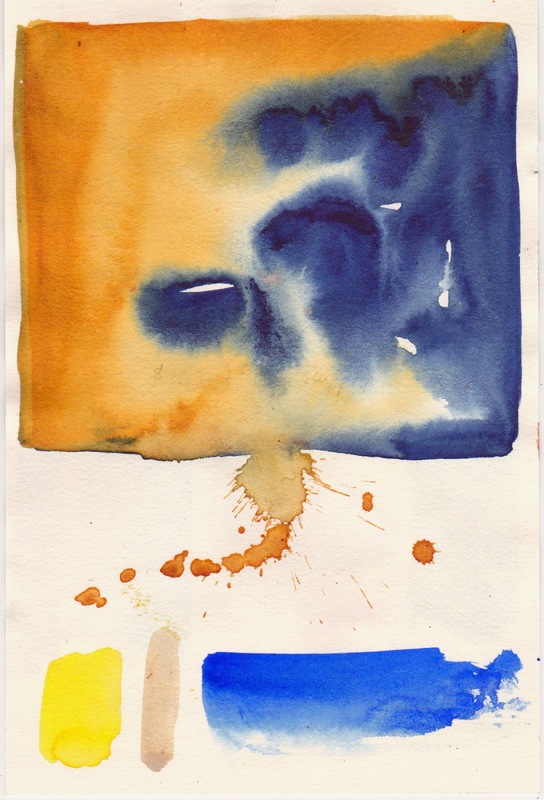 I always prefer a medium surface as I find the granulation of watercolour shows up more. For pure drawing and line work these are great and simply gorgeous for pencil. 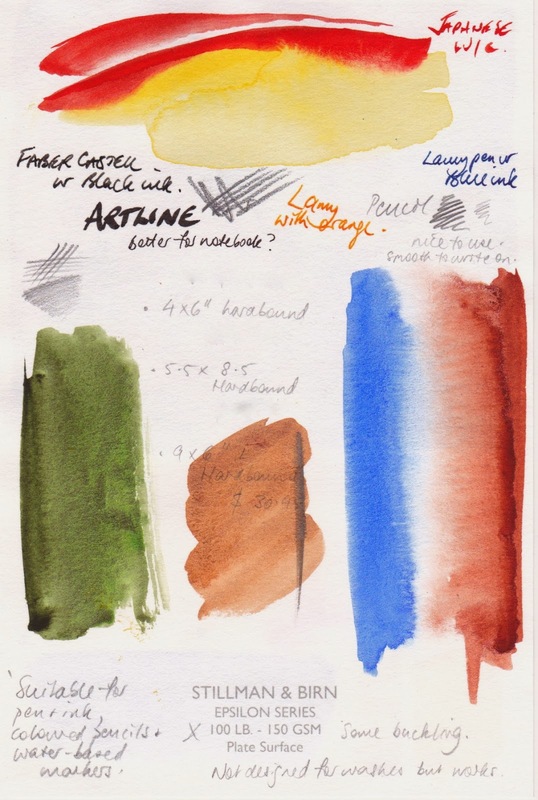 Stillman & Birn Zeta paper test sheet. To be complete, I'll show my tests of the Alpha and Beta papers here too. This is the Alpha paper again. It really is quite special - some buckle but remarkably little for a relatively thin paper. Colours look bright - brighter than the smooth papers? Or am I imagining it? ...and this is the Beta. 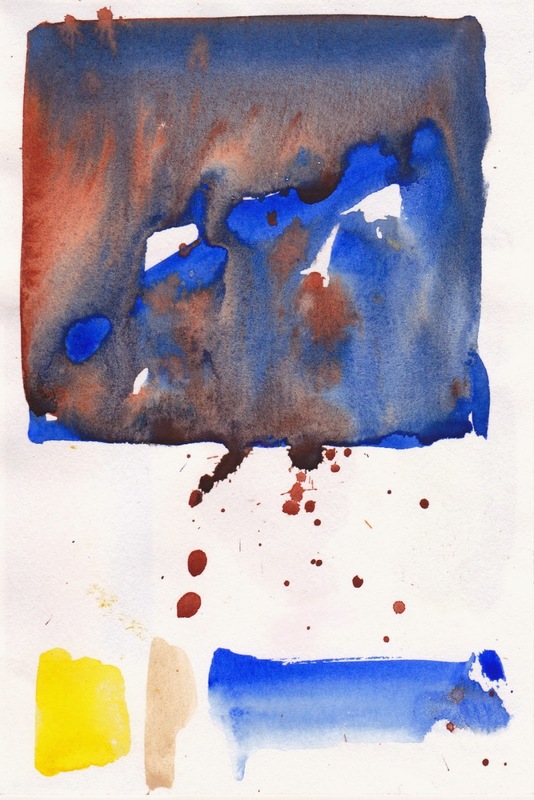 Great paper that takes watercolour really well on both sides of the paper. Also fine for pen and other line work but not a smooth as the Zeta and Epsilon. 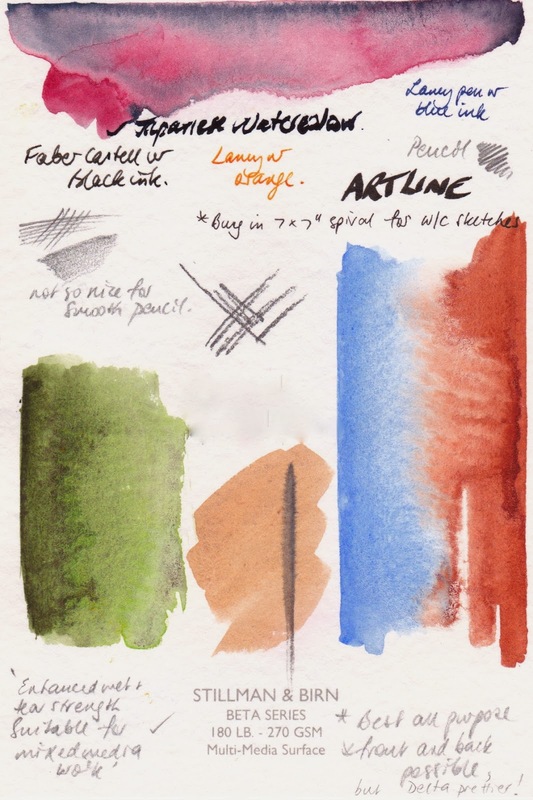 Stillman & Birn Best test sheet. 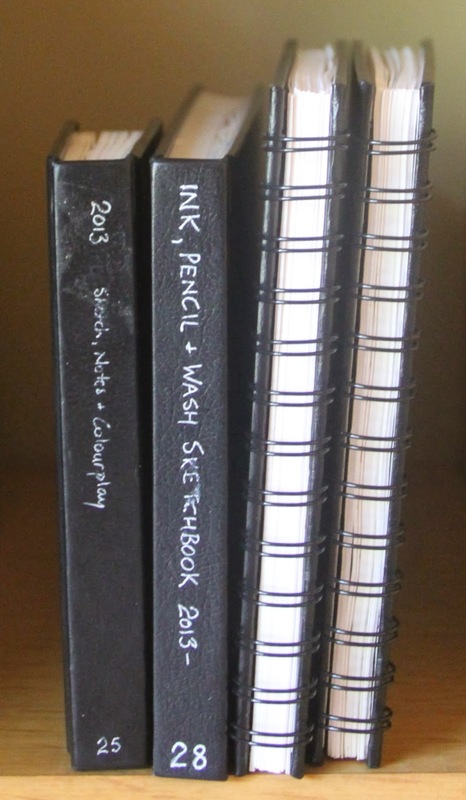 So something for everyone in this wonderful range of sketchbooks. Next up - other sketchbooks I've tried, though I think the Moleskine and Stillman and Birn are probably the most universally available. Make sure you try the Book Depository if you can't find them near where you are. Thanks Jane. That was incredibly helpful. Hi Jane, another great post. I have an A4 Alpha, which I find superb for drawing, with just enough tooth. 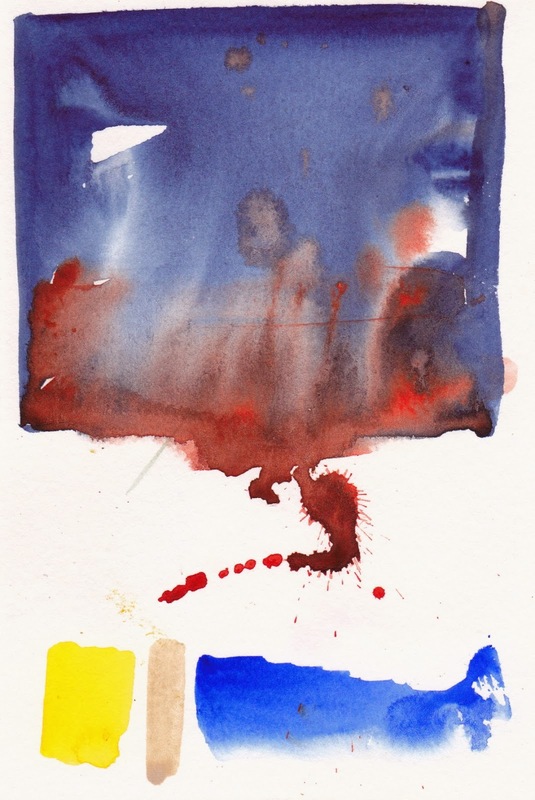 I also have an A4 Beta 270gsm, which takes unbelievable amounts of working and the paint sits beautiful and bright. The other two are both Zeta's which are incredibly popular with botanical artists over here in the UK. They are 270gsm smooth, not quite hot press but near, and like the Beta take a lot of working and the results are luminous almost. One of the Zeta's is A4 portrait as the Alpha and Beta, but I also have one of the new type with a soft cover. These have exactly the same paper, but look more like a journal with an extremely tough wipe clean cover that is flexible but not very soft. I love them. 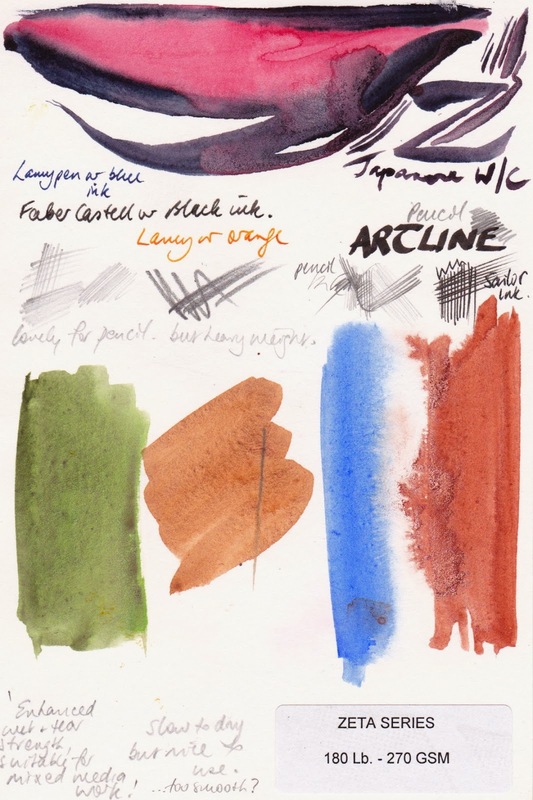 The Alpha paper is remarkable - nice for drawing but takes washes better than any other 150gsm paper Ive tried so you can have a sketchbook with lots of pages to play with! Botanical art traditionally doesn't have a background so paper that is more difficult for painting large areas - smoother papers - work for botanicals as they may not for other purposes.